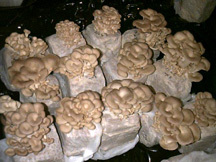 Mushroom growing has the potential to be a fun and fascinating pastime. Our forests have provided many species of fungi that are both beautiful and delicious, and learning to cultivate them can revive our connection to nature and the earth. But if we have to buy a lot of equipment to sterilize substrate and clean the air of contaminants, growing mushrooms can lose its romance. And it can get absurdly complicated when cultures keep spoiling, despite our most elaborate precautions. So why use hydrogen peroxide in mushroom growing? Hydrogen peroxide simplifies the whole process of growing fungi. There's no need to build a sterile laboratory, buy a special giant pressure cooker, or even construct a glove box. A low concentration of peroxide keeps out the contaminants, while allowing healthy growth of mushroom tissue. And as the mushroom tissue grows, it converts the peroxide to water and oxygen, leaving a clean, vigorous mushroom culture. Grow mushroom cultures in an ordinary room. Handle cultures in the open air in a kitchen or non-sterile workshop. Protect cultures from bacteria, yeast, mold, and mushroom spores. Prepare mushroom cultures without an autoclave. Prepare bulk fruiting substrate at room temperature, without heating and cooling. Do away with costly filter-patch culture bags; use ordinary trashbags instead. Prepare sawdust-based mushroom spawn medium with just a ten minute steaming. Grow mushroom spawn and agar cultures on a bookshelf or in a closet. What's in Volume I of the peroxide manual? What's in Volume II of the peroxide manual? What's this about Non-Sterile Mushroom Cultivation? How do I order the manuals? About the Author Found a link that's not working? Please e-mail me. This document is Copyright: ©2010 by Randall R. Wayne, Ph.D. All commercial rights are reserved. No part of this work may be reproduced or used for sale in any form or by any means without permission of the author.